But still. It’s therapy. It’s good for me. Each day, I awoke, grudgingly, shortly after sunrise, sunlight streaming through the white shades in the lilac-walled master bedroom. The sounds of the kids whispering in the hallway and clopping up the stairs was enough to get my mind moving, anticipating the day ahead. Breakfast was boxed cereal on most days, but on that special first morning, we were treated to gooey slices of Julia’s cream-cheese-stuffed french toast. Hours at the beach, sweaty and sandy with salt-pinched skin, were followed by cool dips in the lap pool and lunch breaks in the crisp, air-conditioned beach house. I read books even. Books without bunnies or princesses or dinosaurs. I finished Gone Girl (wow) and moved on to Sharp Objects (completely disturbing but addictive). Gillian Flynn’s novels, so evocative and unsettling, have sucked me in like a bad habit. After finishing her first book on that last day full day spent lounging on the beach, I downloaded Dark Places , the second of her three novels, to my Kindle. I just can’t get enough. I adore reading – and I got to do it for five days in a row. Can you imagine? And so, we’re home. 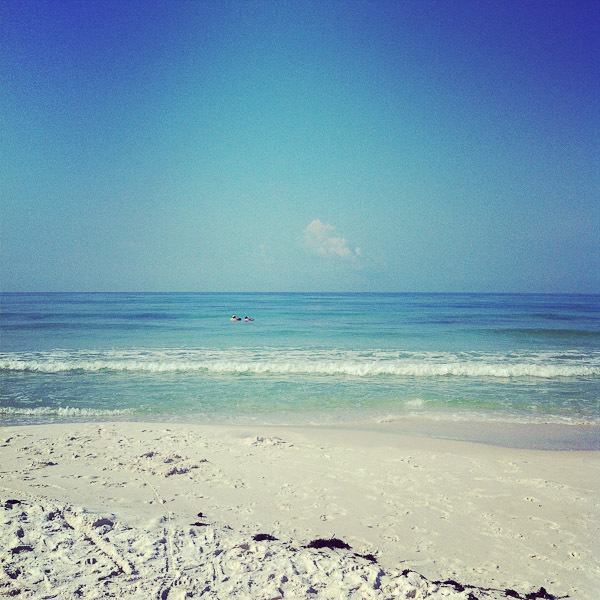 Back from the beach, and back to our suburban lives without sand and salt water and sunscreen-sticky limbs. I’m playing at Stay At Home Mom these during these last days – hours – before the weekend. I’m not very good at this game. Just ask my kids – they’ll probably tell you the same. I lack patience. I like a clean home – clutter and toys and Play-Doh drive me crazy. I like time to write or read or clean. Or sit quietly. None of this happens when I play Stay At Home Mom. I try to be better, try to overcome this problem, but it’s a constant struggle. So, I’m doing my best. Making it work. And trying not to check my work email, that one part of my life where I feel In Control. I asked the kids yesterday, our first full day home since returning from vacation, what they wanted for dinner. This corn made the top of the list. I’d made it before, and they were immediately enchanted — as was I. The name is a bit of a misnomer. Skillet-fried corn is really a version of creamed corn, but no cream is added. The special ingredient that makes it creamy is time. Lots of stirring and time. It’s a simple recipe, but patience is essential. Much like being a parent, really. This recipe comes from Cook's Country (and is reprinted with their permission). I adapt most recipes, but this one is simply perfect as-is. Stirring and cooking slowly are the key components to making this recipe work. 1. 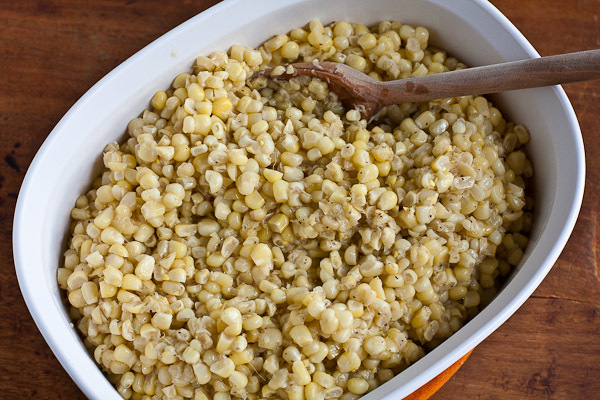 Remove the kernels from the corn cobs, collecting them in a large bowl. With the back of a knife, scrape the corn cobs over the bowl to catch any remaining liquid and corn bits from the cobs. 2. In a separate, small bowl, combine the flour, sugar, salt, and black pepper. Set aside. 3. 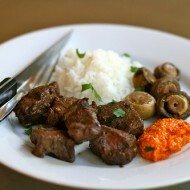 In a large nonstick skillet over medium-high heat, heat vegetable oil until shimmering. 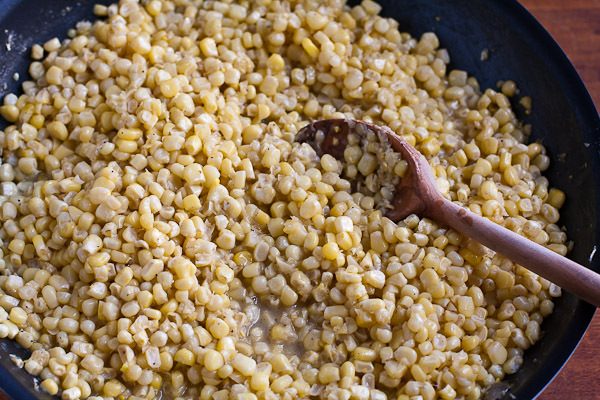 Add corn kernels and cook, stirring occasionally, for 8 to 10 minutes. Reduce heat to medium-low, stir in the flour mixture, and cook for 1 minute. Add 1/2 cup water and cook, stirring continuously until water has evaporated, approximately 8 minutes. Add the last 1/4 cup of water and cook, stirring constantly until water has evaporated, for another 10 minutes or so. Remove from heat, stir in butter, and serve while warm. August/September 2012 issue of Cook's Country. 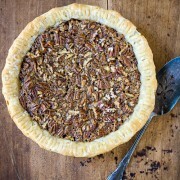 A pecan pie without loads of corn syrup…how darn refreshing! Kuddos to Cook’s Country…and bask in the ability to still be wearing flip-flops, however I crave layers and boots and jeans come September. Not sure I would last in a Florida climate. Hoping your birds return soon and those pesky squirrels will return in no time…especially since you filled your bird feeders! I love the addition of the orange zest. 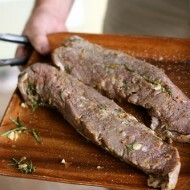 Great recipe and beautiful photo! I just made this pie today – I didn’t use the orange zest as I was working from the original Cook’s Country recipe – and I was curious how other’s liked it. I didn’t care much for the molasses – not that it was awful, but I definitely wouldn’t make it again.